HOLLYWOOD JUNKET recently participated in a phone conference call with contestants Tia Carrere, George Takei and executive producer and boss Donald Trump to get insight into the new season so far. Last week’s episode of “The Celebrity Apprentice” ended with George Takei, best known from “Star Trek” series being the one who was fired. There’s one “Star Trek” character that maybe could have saved him. 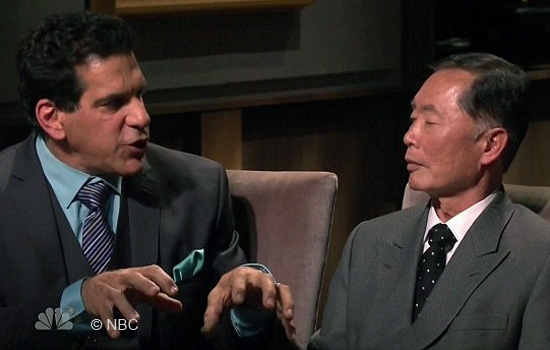 Our reporter asked Takei if he could select any member of “Star Trek” to be on “The Celebrity Apprentice” with him to ensure victory, who would it be and why. George Takei answered William Shatner’s “The Captain”. Listen to excerpts below of the audio from the interview as Takei and Carrere both talk about their charity, and the other celebrities on the show that surprised them most. Trump gives some teasers about what’s to come for the mens’ team this season. “The Celebrity Apprentice” airs every Sunday night on NBC at 9/8 c.